The growing field of ADA signage is a multi-billion dollar business annually. Accessible interior signs complying with the ADA guidelines are required for all publicly accessible buildings including hospitals, schools, colleges, corporate headquarters, restaurants, etc. A basic understanding of ADA accessibility guidelines is required to produce accessible signs that comply with federal regulations. 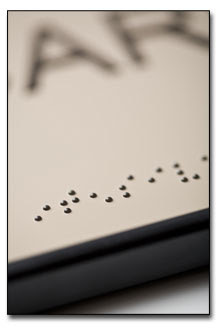 Check out our guide to learn how your laser engraver can produce high quality ADA signs.